Making the case for more vacation time are: Shelton Johnson, a ranger naturalist in Yosemite; Rick Steves, the world's best-selling travel writer; and Sara Speck, cardiologist and director of a cardio-vascular wellness program, who tells patients to "take two weeks and call me in the morning." "Finally there is a film that addresses over-work in the United States and offers a real world solution for making change. The Great Vacation Squeeze is well researched, fun, and accessible. It would be a valuable addition to a wide variety of courses including Medical Sociology, Social Problems, Social Movements, Intro, Sociology of Work and Leisure, and more." "A useful tool for jump-starting several conversations in the classroom. Additionally, it discusses a topic rarely discussed in the United States- the lack of mandatory paid vacation - and the unique and potentially detrimental effects that policy decision may have on the American worker." "The Great Vacation Squeeze reminds me why I became a parks, recreation and tourism professor by focusing on the power that vacations have on people's lives. While economics are the traditional starting point in studying and teaching tourism, the documentary goes beyond in examining the social, cultural, personal, educational and health benefits of vacations. 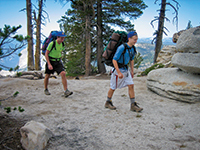 The film challenges park and recreation educators and their students to better understand and better communicate the potential leisure travel plays in American's quality of life. However, the documentary doesn't stop there; it takes vacations into the role of politics and public policy in addressing the shrinking number of Americans taking vacations and the number of days they sneak away. Watching The Great Vacation Squeeze provokes and informs. I look forward to using the film in my classroom and the discussion and debates that emerge from my students." "With his typical wit, wisdom, and artistry, film-maker John de Graaf has once again revealed a universal truth that has spanned the ages since early civilizations, but has yet to fully reach modern America--that time is our most precious resource and it is best invested in life, not just work...I recommend [the film] for courses related to health, recreation, and education. Indeed, I recommend The Great Vacation Squeeze for any setting where people are concerned for the health and well-being of themselves and their communities." "The film makes a strong case that many Americans today are missing out on a key element of the pursuit of happiness: time off to recharge, reflect, and reconnect. It's sure to generate lively discussion about the exceptionalism of the United States in not guaranteeing the right to take an annual break from work." "The Great Vacation Squeeze brings to light the vast differences between the United States and other developed nations with regard to paid vacation time...This well-made documentary sheds light on a serious issue that requires attention in the U.S. and can be an excellent educational tool for students in various areas, including public health, public administration, tourism studies, anthropology, labor, and economics and will hopefully initiate a serious dialogue on the matter." "A perfect fit for the university classroom. Students thrive on facts and well thought out testimonials from the experts and they are all here in a compact, thought-provoking format. It is a perfect opportunity to open discussion of what a quality life really entails. And, after all, it is this generation which has the most to lose if vacations keep dwindling. Someone or something needs to light their fires! This topic easily fits into subject areas of recreation and leisure studies, all the social sciences, travel and tourism, education, and of course, business." "Time researchers have convincing evidence that vacation time is not only related to the psychological, social and physical well-being of the individual but results in more effective and productive workers over the long term. The lack of vacation time in the United States compared to that in other countries is inexcusable. This film makes the strongest case yet for vacation legislation. I am recommending it to everyone concerned with the quality of their lives. I also believe it should be essential watching for university classes studying any aspect of the psychological, social and physical well-being of Americans and our society." "Pope Francis recently suggested that 'busyness is the enemy of human purpose.' He's right! We all need to regularly disconnect and re-create ourselves. We all need meaningful work; and, just as important, we all need meaningful play and vacations!"